I am very pleased to share that I2SL had another successful year. I2SL continued to offer monthly educational webinars, support the excellent work of a variety of technical working groups, and host the 17th consecutive annual conference. Through its chapters, I2SL has also seen many successful educational and networking programs across the country that brought I2SL's message to many communities, stimulating involvement with its mission. I was happy to participate in education days hosted by the Heart of America Chapter and the Colorado Chapter, each attracting more than 100 local participants. The success of these events was encouraging and confirmed the chapters' unique opportunity to reach individuals who might have not otherwise been aware of the value of I2SL. Chapters have become very important vehicles to I2SL, and I encourage you to seek out and become involved with your local chapter. If there isn't a chapter in your region, please contact me if you would like help starting one! In September, I was pleased to join hundreds of attendees in San Diego, California, for an engaging and informative 2015 I2SL Annual Conference. The quality of this year's technical sessions was again superior, and the location offered beautiful views and plenty of sunshine! I was also honored to recognize the winners of this year's Go Beyond Awards during an awards luncheon at the conference. As I2SL continues to grow, there is an exciting change on the horizon for 2016. I2SL will retire the Sustainable Laboratory Times newsletter and transition to sending a monthly email that will provide targeted messages highlighting useful tips, resources, and information to help you design, construct, maintain, and use sustainable laboratories and related high-technology facilities. Watch your inbox for these emails beginning in January. If you have information you would like to share that could benefit the entire I2SL community, please email us! 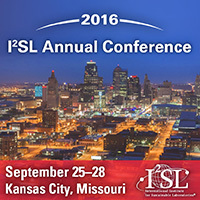 In addition, please mark your calendars for the 2016 I2SL Annual Conference, which will take place from Sunday, September 25, through Wednesday, September 28, 2016, in Kansas City, Missouri. The conference will offer valuable technical sessions, time to interact with exhibitors in the Technology and Services Fair, and several networking opportunities. I look forward to tasting Kansas City barbeque and hope to see you there! 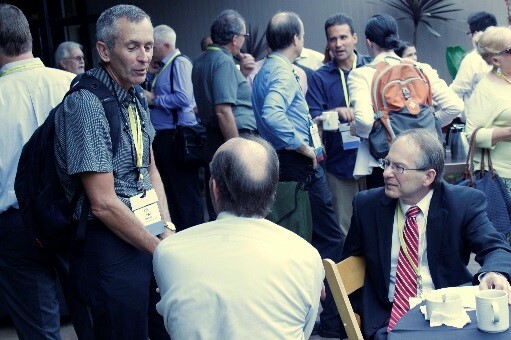 Frankly, I am inspired by the quality interactions that continue to take place at the annual conferences. I am encouraged by the energy and intensity of the work and progress of the I2SL Chapters. I look forward to a strengthening organization that is being built by so many motivated individuals. I believe I2SL is most valuable and influential because of the passion and engagement of this community. I thank you for your commitment to develop and promote sustainable laboratories and related high-tech facilities through I2SL. "I'm a first-time attendee, and I can't say enough good things about the conference. I really appreciate the experience and feel that what I learned will be valuable in my upcoming projects." "I always attend! This is a great networking and learning event." Attendees came from 10 countries and nearly 250 organizations. Attendees listened to presentations by more than 100 speakers and earned over 1,100 continuing education credit hours. The latest technologies, systems, and services were shared by 32 exhibitors. four winners of the 2015 Go Beyond Awards were recognized during an awards luncheon: James Dykes; Allison Paradise; the Jackson Laboratory for Genomic Medicine; and the National University of Ireland, Galway Biosciences Research Building. More than 80 percent of conference attendees used the conference app. Conference attendees can still access the app and use it to recall specific presentations, speakers, and contacts. Mark your calendars! 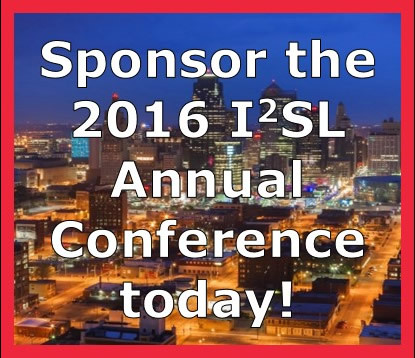 The 2016 I2SL Annual Conference will take place from Sunday, September 25, through Wednesday, September 28, 2016, at the Sheraton Kansas City Hotel at Crown Center in Kansas City, Missouri. The Call for Presenters will open in early 2016. You can make your hotel reservations in I2SL's block at the Sheraton Kansas City Hotel at Crown Center online or by phone. Per diem rooms are also available. Exhibitor registration for the Technology and Services Fair is now open. Put your organization in front of I2SL conference attendees and share your technologies, systems, and services with our niche audience. Sign up for your booth today! 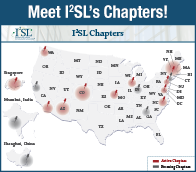 I2SL welcomes its newest chapter, the Philadelphia Chapter. The founding chapter officers are Thomas Kolsun (president), Kevin Chriswell (vice president), and Nykia Gantt (treasurer). Contact the I2SL Philadelphia Chapter to learn more, including how to join. I2SL Chapters are planning exciting events for 2016. Check I2SL's website often for new listings to find out what is happening near you! Starting to think about your resolutions for 2016? Become an I2SL Member to stay on the frontlines of I2SL's initiatives and enjoy benefits like discounts on conference registration and free access to all of I2SL's High-Tech Talks Webinars and the Annual Conference Presentations Archive. Join today and get a jump-start on your New Year's resolutions! Watch for the December 2015 issue of Laboratory Design Newsletter, which will feature select extended abstracts from this year's conference speakers and a write-up on I2SL's 2015 Go Beyond Award winners. The Call for Presenters for the 2016 I2SL Annual Conference will open in January. Check I2SL's website and your email in the new year for details! The monthly High-Tech Talks webinars continue in 2016. Check I2SL's website to view the webinar schedule. In the meantime, I2SL Members can access past webinars for free in the webinar archive by logging into the Member Portal. The I2SL High-Tech Talks Webinar Series seeks speakers who would like to present an hour-long webinar session in 2016. Please contact I2SL if you are interested in this opportunity.